I was contemplating a VW TDI engine, Smartfor Two, or Fiat 500 Turbo 2cylender one. Forget the Fiat 2 cylinder, in road tests it's using far more fuel than its official rating in the 500 - even when driven sensibly. If you really want to go ahead with this, start from a Smart - it's already got the rear mounting, rearwheel drive set-up. A local bike mag started building a diesel bike based on a Smart diesel (0.8 L). Dunno what became of it though. Kool, my only concern will be getting air to the intercooler I can work that out in the body design. CDI engines are starting to come down in price overhere. There are plent to choose from in Canada. The bike mag and the tech school they worked with, had some serious issues with changing the drive configuration to a mid-mounted engine in the bike, driving a chain (or belt ?). They also bought a whole car that had been in a collision so they had all the accessories to go with it. From the pics they took, the Smart engine & drive train package is rather compact. Being a tiny displacement engine, its air and cooling requirements aren't that big either. If I had to use an ICE I would use a small diesel front drive unit in a reverse trike or a mid engine to a motorbike rear end depending on if I want to bother with a passenger seat or two. With a single seater I would be tempted to use the fuselage from a glider if I could find one. But apart from the little detail of an ICE here is what I am building in my basement workshop. 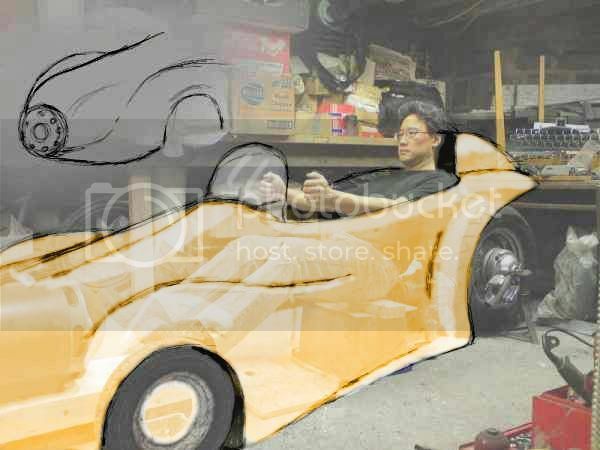 I am scratch building a single seat reverse trike but electric. The aim is to keep below 350kg plus driver and batteries. I want to use it for my 30 mile each way commute where I am on my own with just a soft bag or two. The front wheels are too small, they are just stand ins. Now I have a BMW K100 rear end I have moved the motor to the mid position. It gives luggage space and allows a Kammback to develop from the back of the cockpit. I will be keeping the big fat rear tyre from the earlier photos and fitting it to an MGA 15" wire wheel with centre lock nut adaptd to teh K100 final drive. Taking a leaf out the Blastolene cars, the Boss Hogg and the Napier Railton I am using a 12" motor! The motor isn't just for the sake of it, or because I can (ok, it is) but it is also such a big lazy easy spinning motor that brings the CoG very low down. Anyway, for the benefit of this thread it is a bit of 'putting my money where my mouth is' as I do keep saying that an electric single seat reverse trike is the best solution for me. I just hope I can afford to finish it. Location: Cut Off, LA, USA. 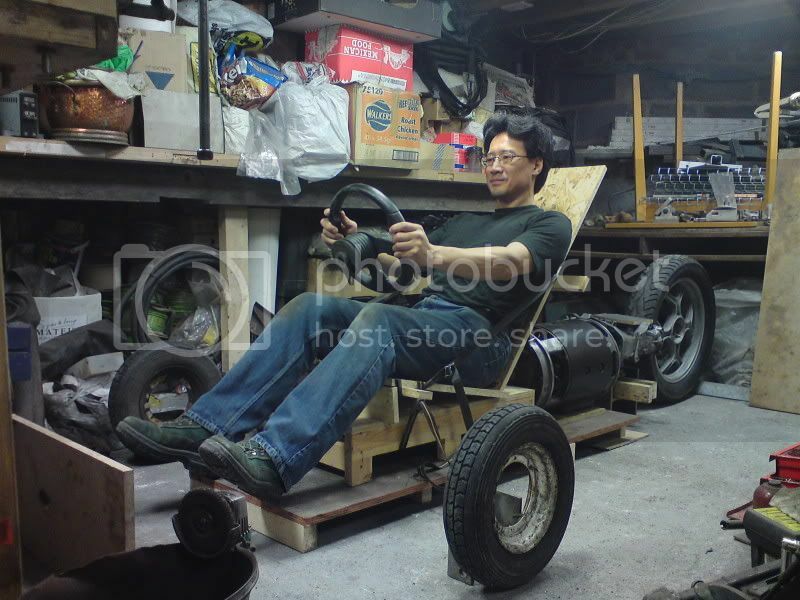 If I were building something on a budget to satisfy this, I think it'd probably have a Honda ED-series engine putting power through a freewheeling preselector gearbox into a shaft-drive single rear wheel (BMW motorbike style). 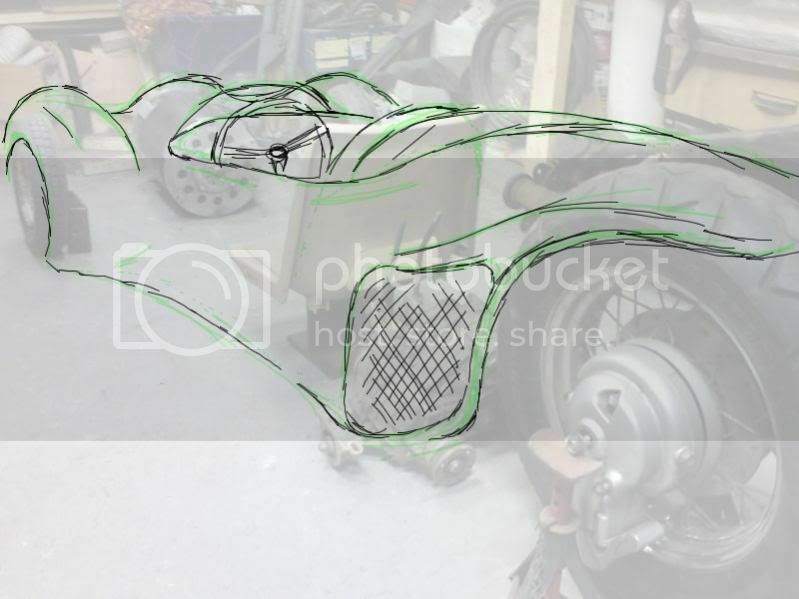 Tadpole design, narrow front (think Morgan 3-wheeler style) with ducted cooling up the back. Bulkhead-mounted fuel tank, polycarbonate fairing. Front suspension single wishbone/tilted strut, which can be faired. Kamm rear end. All off-the shelf, conventional stuff, probably an excess of power available but it'd keep up with traffic, is simple enough that it can shut down when it's not needed and fire up when it is. Low unsprung weight for higher speed handling. Replace Busa motor with PD 150 (the bad boy of 4 cylinder VW TDI) with a tune (makes about 200 whp), adjust the roll bar, run muck longer control arms up front, add bio-diesel, and I'd be near perfect.